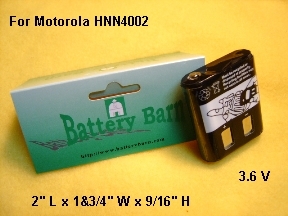 Extended power Ni-Mh battery, 3.6 V , 1300 mAh. Dimensions at 2" L x 1&3/4" W x 9/16" H. This is a replacement battery made by ProStar, You will have one year's warranty from Battery Barn. Priced at $8.95 only, your original charger will charge this battery .